Sveta: New Year and Christmas in Russia! The closer we come to our New Year holidays the more people ask Google about Christmas, Santa Claus and Grand Father Frost in Russia. Sometimes Google send these people to our site. So I’ll try to answer these questions in this article.When Kyle just came to Russia I warned him that we don’t have Christmas at 25th of December! He was a bit disappointed and maybe did not believe me completely. But it was 24th of December and nothing happened just regular work day in Russia. But I told Kyle just wait for 31 of December – New Year Eve is the same like Christmas in Russia. How do the people meet The New Year in Russia? Then people set a table for eats and turn on a TV; TV channels always have a good transmissions at New Year Ave, some old New Year movies and new New Year movies good concerts and so on… 5-7 minutes before midnight almost all TV channels transmit the Russian President “New Year Speech”… Medvedev always has had a good, kind New Year speeches and it’s always a pleasure to listen to him this way! When the Kremlin Clocks starts gonging, people open Champagne, clink glasses, tell each other С Новым Годом! (what means Happy New Year!) and continue feast :). What about Santa Claus – no Santa Claus, that is Дед Мороз (Grandfather Frost) in Russia. And Grandfather Frost comes to the children at this, New Year night and put presents under the Fir Tree. Really, there is not too much differences between Grandfather Frost and Santa Clause – and even in the stores we have a lot of Santa Clauses made in China, 🙂 together with Grandfather Frosts and people buy them all and still call them Ded Moroz (Grandfather Frost). 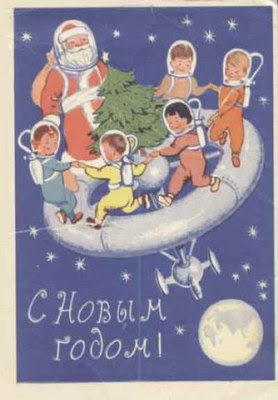 Russian kids know the story about Santa and like it. They also know that Santa comes to kids in other countries and they wait for their Russian, Ded Moroz… then on the 1st of January; when parents are sleeping after the long New Year feast, kids are waking up and run to the Yolka (New Year Tree) to look what presents, Ded Moroz have brought to them! They are silent, don’t want to wake up parents, and just enjoy the presents! Now I’ll tell you about Christmas in Russia. First of all I should tell that Christmas in Russia is at the 7th of January. How it could that be, maybe you want to ask me… That is cause of our calendar and our Orthodox Church. Before October Revolution (1917 year) Russian had Julian Calendar and it was not the same like in the rest Europe and America who had already Gregorian Calendar. Russian calendar was “late” for two weeks (Here is a link that you can read about Calendars) When Communists got to power they changed the calendar in Russia and made it the same Gregorian calendar like in other counties. But Russian Orthodox Church refused to change calendar of Church holidays that’s how it happened that Christmas in Russia is going after New Year. During New Year Holidays kids always go to watch New Year performances. The main characters there are Ded Moros and Snegurochka (Father Frost and Snow Maiden – his granddaughter) and now Ded Moroz tells public “С НОВЫМ ГОДОМ! С РОЖДЕСТВОМ ХРИСТОВЫМ” (Happy New Year and Marry Christmas!) And the mention of Christmas is one more of the changes that happened since Soviet Union collapsed. Best wishes and be happy!